I V Gone, under jockey Cody Wainscott, winning the inaugural running of the $37,500 Jerry Jaggers Memorial Stakes Saturday afternoon at Will Rogers Downs. CLAREMORE, OK�NOVEMBER 5, 2016�I V Gone held off a fast closing Exquisite Stride by a neck to win the inaugural running of the $37,500 Jerry Jaggers Memorial Stakes Saturday afternoon at Will Rogers Downs. Apollitical Man finished one-length behind in third place. Ridden by jockey Cody Wainscott, I V Gone completed the 350 yards in :17.319 seconds to earn a 102-speed index. Juliana Mancillas saddled the gelding to his 10th career win in 37 starts. The $22,338 winner's purse boosted I V Gone's earnings total to $163,659. Owned by Celesse Fregoso, I V Gone entered the race off a runner-up effort in the $18,000 OQHRA Fall Classic on October 15th. 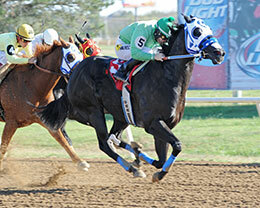 Bred by L.P. Frank, the Oklahoma-bred son of IVORY JAMES is out of Bye Bye Bygones, by Takin On The Cash. Also a graded stakes winner, Exquisite Stride was making final career start for owners David Dunn and Sherry Dunn. Michael Taylor saddled the son of Carters Cartel with Joe Badilla, Jr. getting the riding assignment. John Andreini bred Exquisite Stride in California . Coming off a win in the OQHRA Fall Classic on October 15th Apollitical Man lacked late response from jockey James Flores to settle for third. Gerry McLean saddled the Apollitical Jess 3-year-old for owner Terry McLean. James and Marilyn Helzer bred Apollitical Man in Oklahoma. He earned $4,095 to bring his earnings total to $54,538. Win Rabbits Fly, Dashin Brown Streak, I Cant Help It, Candys Cartel Cat and Trs Amazing Amanda completed the field. Pollitical Scorpion and Streakin Regard were both scratched.